Confused by the Autodesk Simulation offerings? Get real-time manufacturability feedback early in the design process. Design laminates and reduce testing and weight through simulation of composite materials. Simulate laminate and component behavior using simple structural solutions. Rule out failure modes and determine failure loads with robust and efficient plugins for finite element analysis. 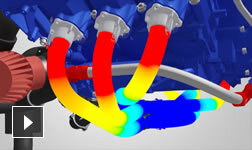 Simulation CFD and Flow Design software provide accurate and flexible fluid flow and heat transfer analysis. Solve, analyze, and make decisions earlier in the product development process. Simulate airflow and wind tunnel testing around any virtual structure.